The 123rd Member of the Soccer Fitness 20 MPH Club, Matthew successfully completed 2 separate, 4-second running bouts at a top speed of exactly 20 miles per hour, on Thursday, February 21st, 2013. 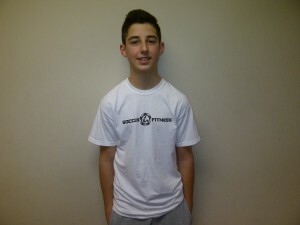 A 1998-born midfielder, Matthew has been training with Soccer Fitness since the fall of 2012. He has ambitions of playing university soccer when he is finished high school. Congratulations Matthew, and we are looking forward to continuing to help you throughout your soccer career.